More people are who depend on iPads and iPhones to handle chores that once required a PC to complete, but some routine tasks seem to be hopelessly difficult or needlessly complex. How, for example, can you capture photos and documents on an iOS device? At CES, Ion Audio--best known for its diverse and playful collection of speakers and mini-arcade systems for iPods, iPhones and iPads--demonstrated a pair of scanners that digitize photos, slides, and documents, and save them directly to an iPhone or iPad--no PC required. 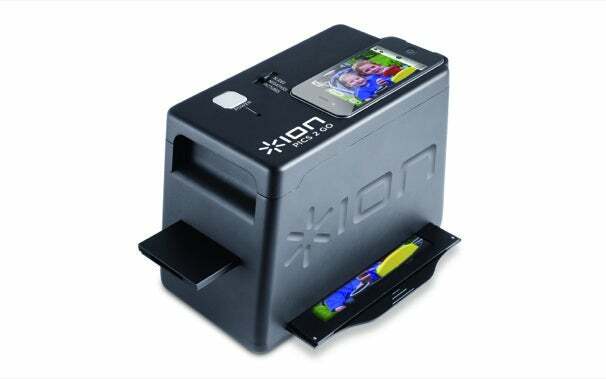 Ion iPics 2 Go, for the iPhone 4 and 4s, is actually not so much a scanner as what Ion calls a “mini photo booth” that uses the iPhone’s built-in camera to capture images on negatives, slides, and printed 3-by-5 or 4-by-6-inch photographs. You place the iPhone, camera side down, on top of the toaster-shaped device; place the print, slide, or film in one of the provided trays (which have hinged frames to keep them from bowing); and capture the content on the iPhone. Ion Audio provides an iPhone app that lets you edit the captured image (including inverting a negative into a positive print) and email the image or post it to Facebook. Ion expects to ship Pics 2 Go around midyear with an MSRP of $60. Docs 2 Go, meanwhile, looks more like a conventional portable scanner, but with a slot and 30-pin dock connector for an iPad loaded with Ion’s free scanning app. It accepts prints and documents up to standard letter size, creating 300-dpi scans that appear on the iPad screen as they’re created. Ion also expects to ship Docs 2 Go this summer, with price to be announced later.